The backing track (instrumental) for the song “Jesus is our King” as an MP3 music file. Download the backing track for "Jesus is our King" (instrumental track: just instruments, no singers) as a high quality 320kbps MP3 file. Compatible with iPods, iPhones, Android phones, MP3 players etc. Click Here to hear "Jesus is our King" on the Jukebox. NB: the "watermark" voiceover "You're listening to MGBT.co.uk" is not present on the downloadable files. Let's pray: "Your kingdom come"
Let's say: "Your will be done"
Please observe normal copyright restrictions. 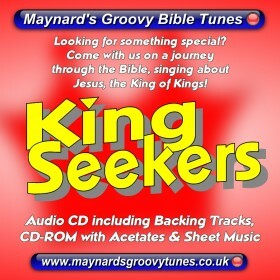 Copyright © Maynard's Groovy Bible Tunes. All Rights Reserved.